Château de Mirambeau was built on the site of an old medieval fortress. Badly damaged after several sieges, destructions and fires, that is around 1570 that the present neo-Gothic north wing was built. In 1813 the domain was sold to Count Charles Nicolas Duchâtel who completely rebuilt the Castle. 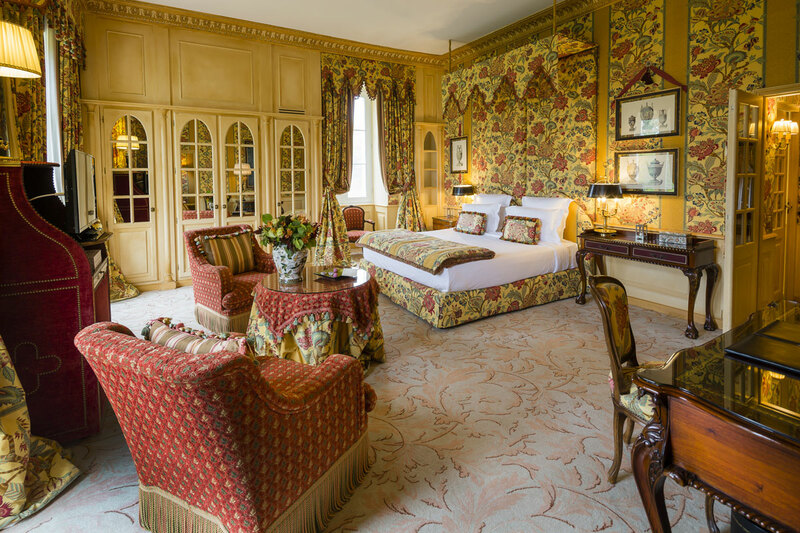 In 2002 the Castle was totally renovated and refurbished with the best of care and attention to convert it into one of the most marvelous French Relais & Chateaux. Since 2006, The hotel belongs to Sorgente Group, which operates in the field of real estate investments and finance, and also acquired the management in November 2010 through the brand Sorgente Hotels and Resorts. Authentic XVII century Renaissance French castle transformed into a 5* Relais & Chateaux luxury hotel. 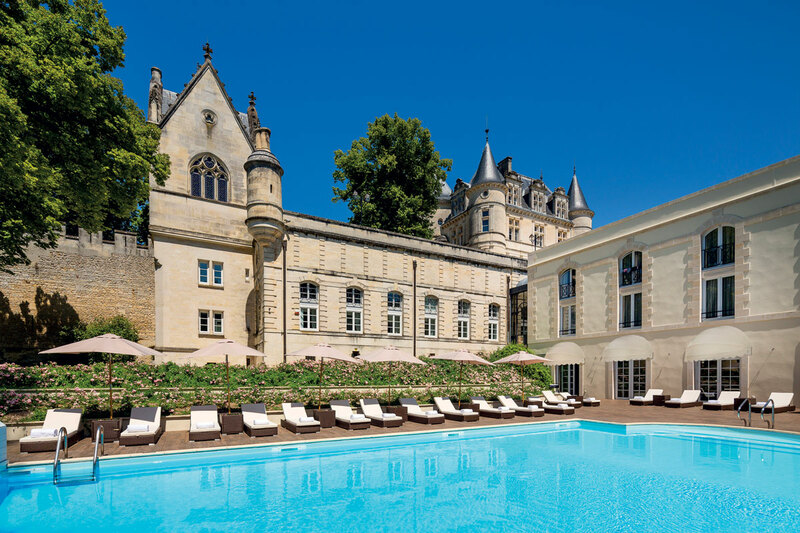 The hotel features: a Michelin starred restaurant, a Spa by Carita, a 20-acre park, 2 tennis courts and the Cognathèque, a vaulted room with stone walls where are served the beverage of the best nearby houses of cognac. 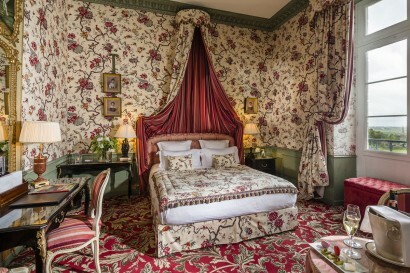 The rooms features truly fairytale style decorations. 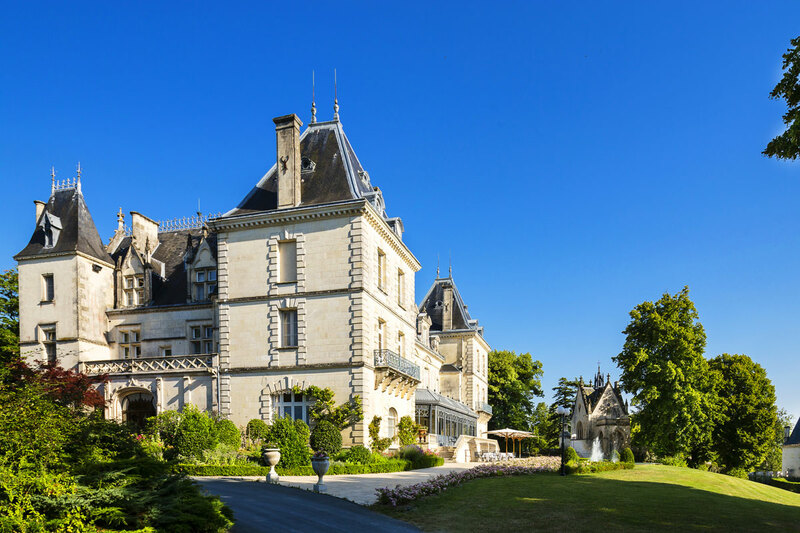 Located in the peaceful and charming countryside of Mirambeau, between Bordeaux and Cognac. Cognac: 50 km – Bordeaux: 70 km – Limoges: 177 Km – Paris: 517 km. 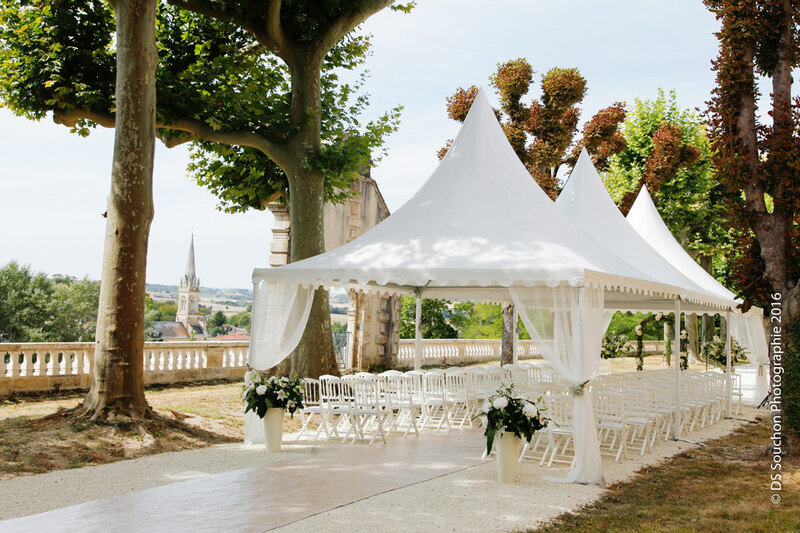 Beautiful Villages & Charming Towns as Cognac, Saint Emilion, Saintes, La Rochelle, Talmont and Bordeaux, a city full of history (UNESCO heritage). For example, in Bordeaux visit the Cité du Vin, 13000 square meters area dedicated to the wine culture. 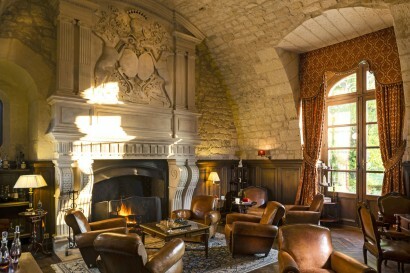 Wines & Cognac: cellars visit and tastings (Saint-Emilion and Sauternes). Bike tours in the park or to the Gironde. 6 Junior Suite: from about 45 sqm, they’re located in part in the oldest side of the Chateau with an outdoor swimming pool view, the other part is situated in the main building and owns a park view. 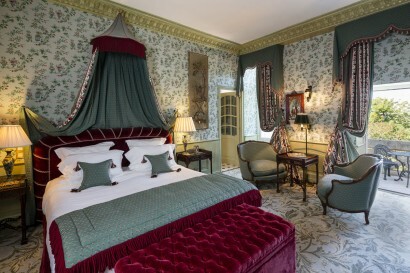 7 Suite: of about 55 sqm, divided between the oldest side and the main building of the Chateau. Extra comfort is provided thanks to the double sink, the separate shower and the big dressing. 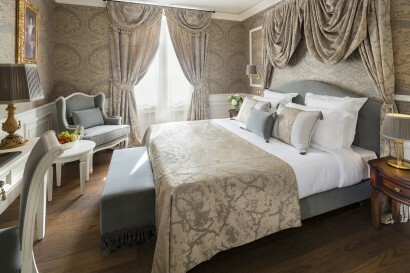 1 Grand Suite: of about 70 sqm, located on the second floor with a beautiful view over the countryside. 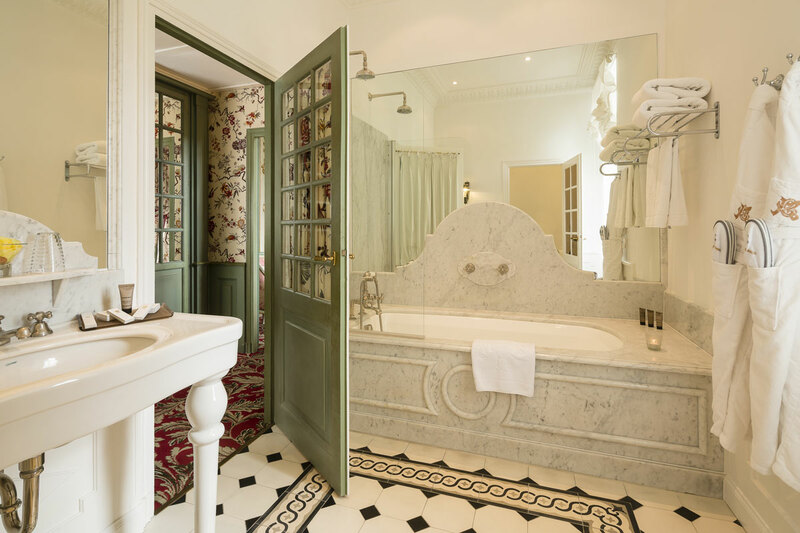 Extra comfort is provided thanks to the double sink, separate shower, large dressing room and a sitting room. 9 Classic room: of about 25 sqm, located at the Orangerie and boats one disable guests room. 10 Superior room: between 25 and 30 sqm including one disable guests room, are located at the Orangerie (outdoor swimming pool and its bambouseraie view). 7 Deluxe room: of about 35 sqm, including one disable guests room, are divided between the Chateau (countryside view) and the Orangerie (outdoor swimming pool and its bambouseraie view). 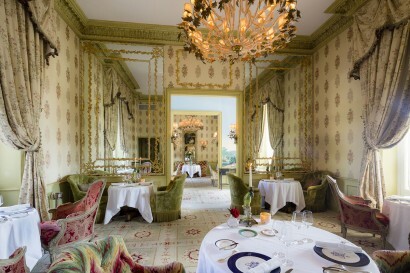 • The Chateau’s Gourmet Restaurant, one star Michelin, is loyal to the best French traditions and serves a fine cuisine in an exquisite setting. 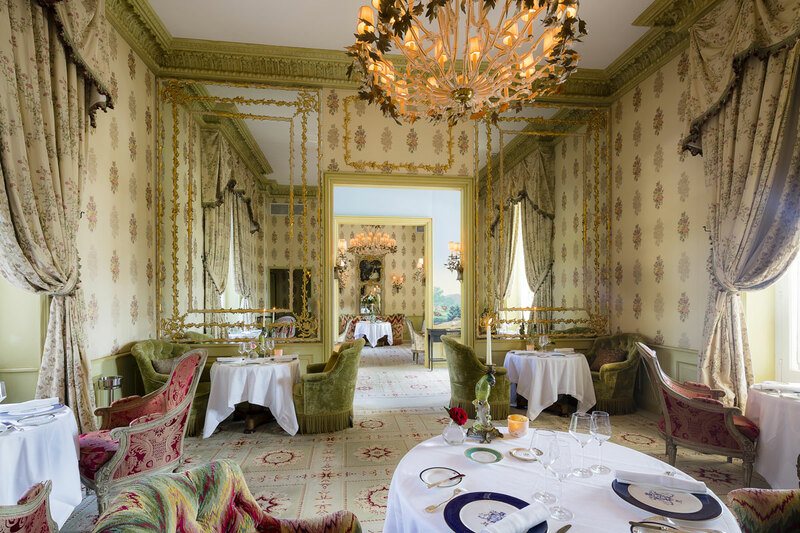 Delightful dishes can be served in the internal rooms or in the Jardin d’hiver, a covered terrace overlooking the fountains and park. • Breakfast (not included in the room rate), Lunch (Lunch menu or Gourmet menus), dinner (Gourmet or Bistrot Restaurant), Bar and room service. Possibility to book B&B or HB plans. 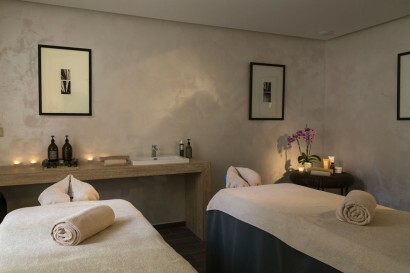 • SPA by Carita Paris: indoor heated swimming pool, Jacuzzi, hammam, sauna, fountain of ice and three treatment cabins. • Corporate: 3 meeting rooms (2 rooms of 44 sqm and a room of 19 sqm). Possibility to organize coffee breaks and corporate lunches. • Celebration events: the castle can be privatized to organize events. 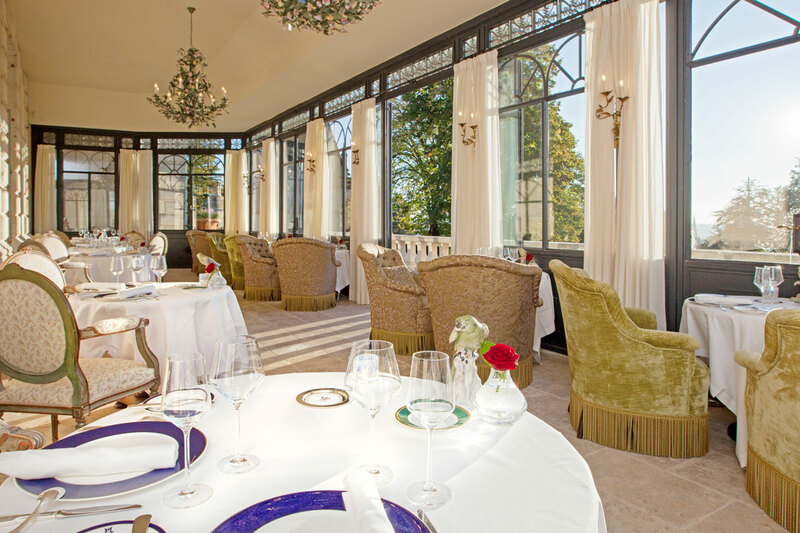 A beautiful 20-acre park, a lovely neo-gothic Chapel, a path planted with plane trees runs along the fortifications, the Michelin starred restaurant with its veranda and the Cognathèque for cognac and wine tastings. 3 long term employees (as it’s a seasonal hotel). During season up to 40.